The world is square. It used to be flat. And after that it was round for a while. But not anymore. Now it is square. Square like a box. There is a box for everything that exists and when there isn’t it doesn’t. Fortunately pockets of roundness survive, dispersed havens of sanctity, little oasis where travelers in a square world can find much needed nourishment. I like to travel between these pockets. What doesn’t fit suits me well. 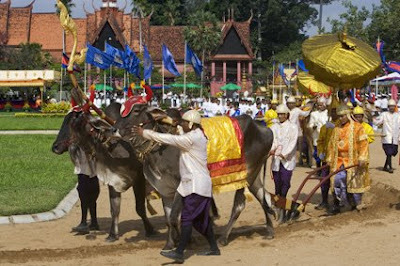 And so I found myself in Cambodia recently, for the Pithi Chrat Preah Neanng Korl or Royal Ploughing Ceremony. A wonderful traditional arcane ritual whereby the Royal Oxen’s behaviour predicts the success (or failure) of the coming year’s harvest. This year, farmers all across Cambodia returned home relieved as, from the 7 trays of produce to choose from, the Oxen took generous helpings of the rice, beans and corn. Sesame seeds, water, rice wine and grass were left untouched, a largely fortunate omen except for the poor sesame seed farmers. 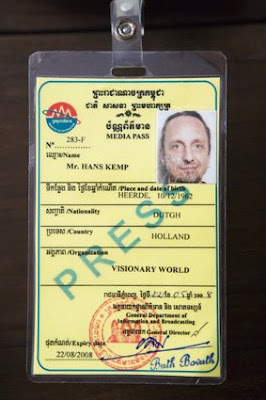 I had arranged for a press pass, a day prior to the event. That was my box and it would hopefully give me access. Staff at the Ministry of Information was helpful but all in all it took around 6 hours to be processed. I was relieved that even after all that time my face didn’t quite fit the space it was given.